I hope all of my east coast friends are safe and sound. This hurricane business is no joke. I couldn’t help but be distracted yesterday at work, especially after BFF sent a text message alerting me that Sandy may be reeking havoc on the shores of Lake Michigan. Sometimes, Google is not my friend. First article that popped up: dangerous winds and 20 foot waves between the town I live and the town I work, with 30 miles of Lake Michigan shores running along the road the entire way. Wonderful. The Midwest has lost their reputation as the safest (and yet, we’re still the most boring) place to live in the United States. By the time I arrived home (safely and unscathed by mother nature), the winds had picked up a lot. Would the wind knock out my internet just as my stupidity nearly stole my cookbook? These kinds of things happen to procrastinators like me. While the weather cooperated, so did dinner. The only good thing about Mr. Prevention being away on work is my opportunity to try recipes he would turn up his nose to. Yes, the man turns up his nose when my response to, “What’s for dinner?” isn’t “Pizza” or “Buffalo Wing _________”. Gotta love’em. And I’ve got to find the positive because when he left on Saturday after being home from LAST week’s business trip for only 24 hours, I cried. I throw the man under the bus publicly on a daily basis, but my god do I love him. More than the day I married him. Heat a medium-to-large stock pot over medium-high heat. Add oil to pan; swirl to coat once hot. Add onion and garlic to pan; sauté 4 minutes. Stir in 3 cups broth, lentils, and next 4 ingredients (through red pepper); bring to a boil. 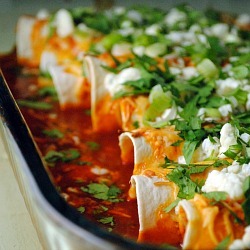 Cover, reduce heat, and simmer 10 minutes or until lentils are tender. 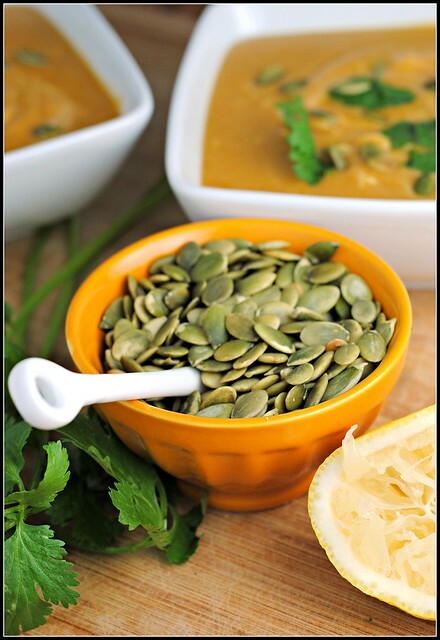 Place the lentil mixture in a blender or blend with an immersion or stick blender. Remove center piece of blender lid (to allow steam to escape); secure blender lid on blender. Place a clean towel over opening in blender lid (to avoid splatters). Blend until smooth. Return lentil mixture to pan over medium heat. Add remaining 1/2 cup broth, 1 cup water, and pumpkin to pan; cook 3 minutes or until thoroughly heated. Stir in ginger and lemon juice. 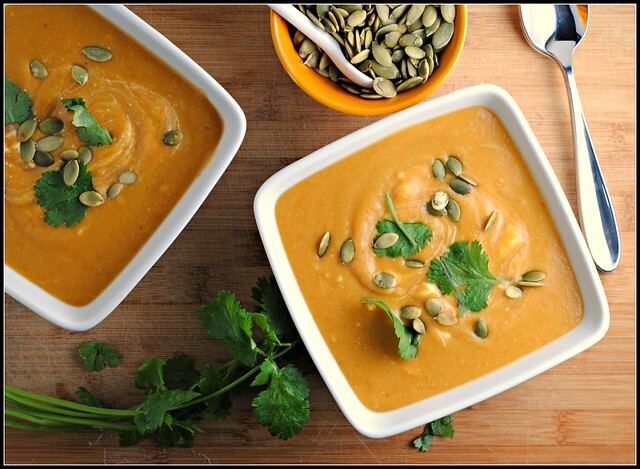 Ladle 1 1/2 cups soup into each of 4 bowls; top each serving with 1 tablespoon yogurt, 1 tablespoon pumpkinseeds, and 1 tablespoon cilantro. Serve hot. Yield: 4 servings (1 1/2 cups each). Result: This was such a perfect fall soup. I increased some of the flavors (lemon juice, ginger, garlic, salt) to give it a bit more oomph, but it was a great soup and very simple to make. This time of year, I use my immersion blender a lot and contrary to popular belief, that inexpensive kitchen gadget is incredibly helpful especially when compared to the dangerous task of blending hot soups in blenders. Enjoy! Early morning meeting. But first, a (small) pot of coffee. I had serious deja-vu when I saw this post today. I *just* pinned the same recipe to try out a few days ago! Looks delicious! Sounds delicious. 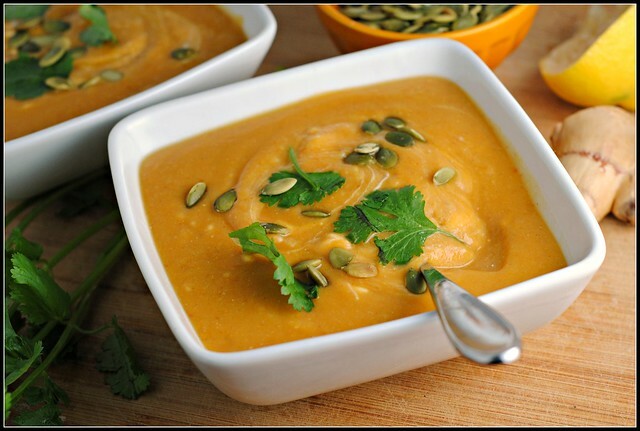 I actually found a recipe for black bean pumpkin soup yesterday on allrecipes.com that I want to make, but this one sounds great too. Seriously, I’m a soup FREAK now that I know Nick will eat really thick versions of it. I need to make up for lost time. So funny – I remember hubby left on a week long biz trip and I started sobbing when he left, too!! This soup looks incredible. Sandy is definitely making her way inland. I was watching the news this morning and the lakefront is out of control right now… and I’ve definitely been checking up on all my friends on the east coast. Scary stuff indeed. Nearly everybody I know in the Cleveland area was or still is without power since last evening. Yikes! What kind of immersion blender do you use? My handheld Kitchenaid mixer has an immersion blender attachment but it does not do the trick. This looks delicious! 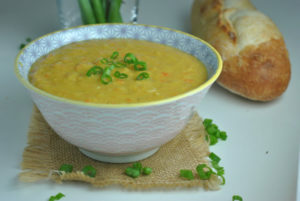 I love red lentils and love how creamy this soup looks! Pinning it to try soon. This recipe looks just delicious! When I went to Canada on that lentil tour, one of the soups we made added lentils. Such a delicious take!! I don’t think of the midwest as being so safe – you have blizzards and tornadoes! Crazy acts of nature can be found anyway! 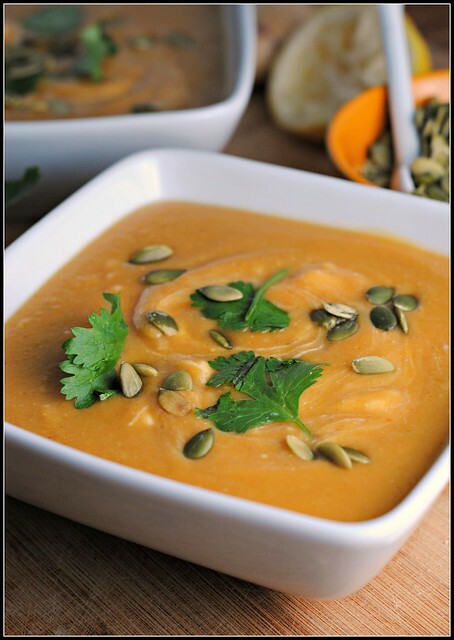 I’d definitely love a bowl of this soup on a cold day like today!